(CNN) -- Somalia is facing life-threatening food and water shortages leaving millions at risk for starvation, the International Committee of the Red Cross said Wednesday. A growing percentage of Somalia's population has become dependent on humanitarian aid. "The Somali people are going through unbearable hardship," said Pascal Hundt, head of the ICRC's delegation for Somalia, in a written statement. "We are witnessing the worst tragedy of the past decade in Somalia." Somalia's last severe famine, from 1991 to 1993, devastated crops, killed between 240,000 and 280,000 people and displaced up to 2 million, according to the United Nations High Commissioner for Refugees. Humanitarian workers view Somalia's food crisis as one of the worst in the world. With winds ripping though the country, hundreds of thousands of Somalis are finding their crops as dry as the surrounding landscape, preventing harvests, killing livestock and leading to a mass risk of starvation. The continual armed conflicts in central and south Somalia have aggravated the situation, hindering people from accessing shelter and medical attention. A growing percentage of the population has become dependent on humanitarian aid. The ICRC, World Food Program and CARE plan to deliver four months worth of food to 435,000 Somalis within the next few weeks. International donors are being asked by the ICRC to provide some of the emergency money. Aid includes giving blankets, kitchen sets and other shelter supplies to 150,000 people. The WFP will be increasing the amount it spends in Somalia to $163 million in food assistance, the group said at a U.N. conference in Rome Wednesday. In addition to drought and armed conflict, high inflation on food and fuel have also exacerbated the situation. Similar factors have affected other developing nations in Africa and other parts of the world. 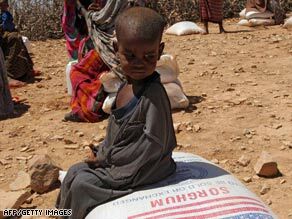 Ethiopia's food crisis has affected 4.5 million people, said the United Nations Children's Fund. As a result of widespread food shortages and little rainfall, an estimated 126,000 children are in need of medical assistance to combat severe malnutrition, while the WFP projects $193 million will be needed for urgent food distributions.